One of the four pregnant cows on the farm at Terra Viva. 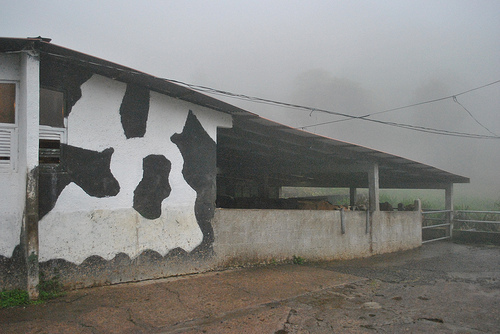 The owners of a dairy farm in Monteverde are turning cow pies into heat. 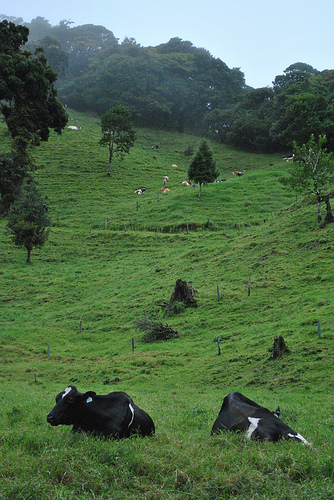 Terra Viva Dairy Farm and Farmstay Lodge in Monteverde, Costa Rica, is converting cow manure into methane gas as one of the farm’s organic farming practices. Federico, a biologist, and Gaudy Muñoz bought the farm 15 years ago and slowly changed practices to be more environmentally friendly. 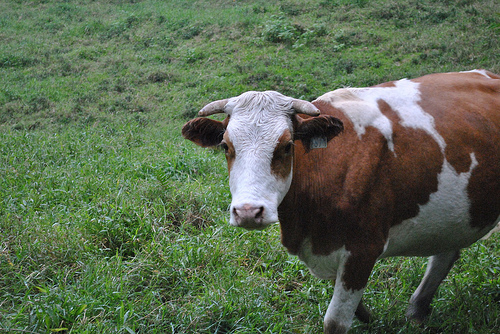 Biogas is used frequently in countries with a high population of cattle, such as India. Biogas is used for cooking and lighting, reducing the amount of methane released in the atmosphere. Gaudy Muñoz said they were selected to receive funding from the government as part of the Productive Reconversion Project three years ago, a project specific to dairy farms. The biodigester at Terra Viva. The farm is approximately 130 hectares. Currently the Muñoz family tends to 80 cows, with 44 producing milk and the others in their “fresh period,” or not producing milk at the moment. Muñoz said her cows could produce up to 45 liters of manure a day. Using a biodigester eliminates some of the negative effects of that waste. Muñoz said project officials came to the farm to estimate how much it would cost to raise environmental standards on the farm. 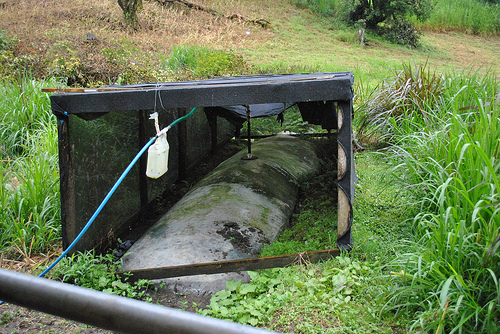 It cost the Costa Rican family around $350 to install the biodigester. Muñoz already had a biodigester, the tank converting the manure to methane gas, but they it replaced with a newer one. In addition, the family created a covered waiting room for the milking cows to collect the manure. The cows are rounded up from the field and led to the waiting room while each cow is milked individually. The process takes around two hours. Covered area for cows to wait during milking. “It keeps cover from the rain,” said Muñoz. The more water that seeps into the urine and manure mixture the less fermentation will take place in the tank. The waiting room was created at a slope to minimize the work load. “We were trying to be efficient by using gravity,” Muñoz said. However, the biodigester does not take solids of the cows’ manure. So the farmer picks up the cow pie and transports it to a compost pile made of grass and manure. Muñoz said they add enzymes to the compost to create a natural fertilizer that she uses around the farm. She estimates that only one-third of the 45 liters of manure a day is collected in the waiting room. The liquids from manure and urine (slurry) slide to the bottom of the waiting room and are channeled into the neighboring biodigester. Inside the biodigester, fermentation takes place. “Biogas is produced in the tank through the anaerobic digestion of the manure by bacteria. These bacteria, which thrive in underwater, oxygen-free environments, consume the animal waste, reproduce, and give off a methane-rich waste,” according to the Santa Fe Women´s Group, a group of women of 19 women pursuing eco-projects in Santa Fe de Guatuso in Northern Costa Rica. 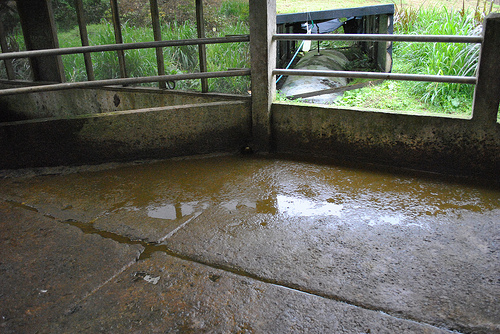 Slurry left behind in the waiting room being channeled into the biodigester. Biogas bubbles rise from the mixture and escape through the surface above. Then a large plastic balloon that hovers over the tank traps the biogas. A PCV tube attached to the plastic balloon connects the biogas to the kitchen, where the gas stove is ready to be used for cooking. At Terra Viva, the biodigester is connected to the stove in the Muñoz workers’ home. The family home and the lodge on the farm use gas from a gas line because the biodigester does not produce enough for each building. Muñoz said production of methane gas depends on the amount of sunlight hitting the biodigester. “On sunny days they have a flame for three hours, otherwise it’s 20 minutes,” she said. Methane gas can also be used to light up a home. However, Muñoz said that they needed a gas compressor and other equipment to make that possible. Cows in the pasture on the dairy farm. The scientists continued to confirm that organic agriculture contributes less to global warming than conventional agriculture. A biodigester is just one small step toward reducing green house gas emissions and organic farming. It is also provides a cost effective alternative for rural communities unable to afford other forms of gas. One such community was the town of Santa Fe de Guatuso, which needed to convert to using biogas. “The price of a tank of gas had cost over $15. Although this is a cost that many people in the developed world could afford, a family in Santa Fe that used more than one tank per month could not likely pay for the fuel to cook its food,” according to the Santa Fe Women´s Group. This leaves biogas as the only viable option for many families and farms in rural Costa Rica. At Terra Viva, the Muñoz family does not use the biodigester out of necessity, but because they want to be as environmentally friendly as possible.